Many years ago, Sam Queen and I conducted a mini-investigation at The Fitzpatrick Hotel in Washington, Georgia. I remember investigating the ballroom late at night, and although we did not believe the investigation turned up any “evidence,” we were both impressed by the beauty and the feel of the old hotel, as well as the history of the restoration as evidenced in the book that was shared at the registration desk. The Fitzpatrick Hotel, and the small town of Washington, Georgia, itself, is a special place, and I remember the hotel and town fondly. It’s funny, because I couldn’t even tell you what drew me to the place. A feeling, I guess. A rogue hunch. I needed to get into that tower room, and Sam and I needed local places to practice before ultimately researching and traveling for the book we worked on in 2012 (Haunted Asylums, Prisons, and Sanatoriums – released in 2013 by Llewellyn Worldwide). The whole town is full of history, and old buildings that beg to be investigated. Built on top of a cemetery from the late 1700s. They moved the headstones away, but not the bodies. Polly Barclay, hung for killing her husband, may be buried in this cemetery. Woman pushed out of window (Room 307) by lover’s wife in the 1930s. Guests report strange energy in that room. You will see that I took a picture in May 2011 of the keys to Room 307. I had no knowledge of the hotel’s history, but was drawn to specially selecting this room for our investigation. Interesting. Robert Geiger, Owner of Talk of the Town (the attached restaurant), gave a story that he’s had a basket thrown out of his hands and smashed into a wall. 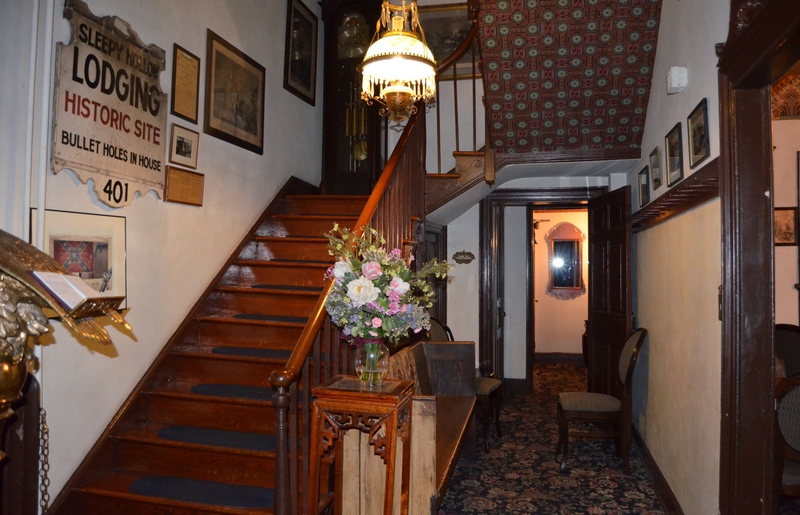 Co-owner, Jim, believes Room 200 is haunted by the Fitzpatrick family. I thought the show was hilarious! Seeing the guys reluctantly participate in some of the paranormal investigations was a refreshing take on the typical “[Insert mysterious loud noise] Did you hear that?” schtick that unfortunately gets overplayed a bit for the paranormal television genre. The Bloody Mary experiment is something that I have never done, and never will do. I can’t look at myself in the mirror for that long of a time in the dark. It’s just not right. Strangely, despite voicing that opinion, Marcus was the one who was woken up in the middle of the night because something touched him. He was not having it at all, and woke his team up. It was time to go. Active dreaming, hallucination, or real unexplainable touch? Who can say. If you ask me, that whole town is haunted. Particularly, that white columned Vampire House that smells old. Trust me on that one. 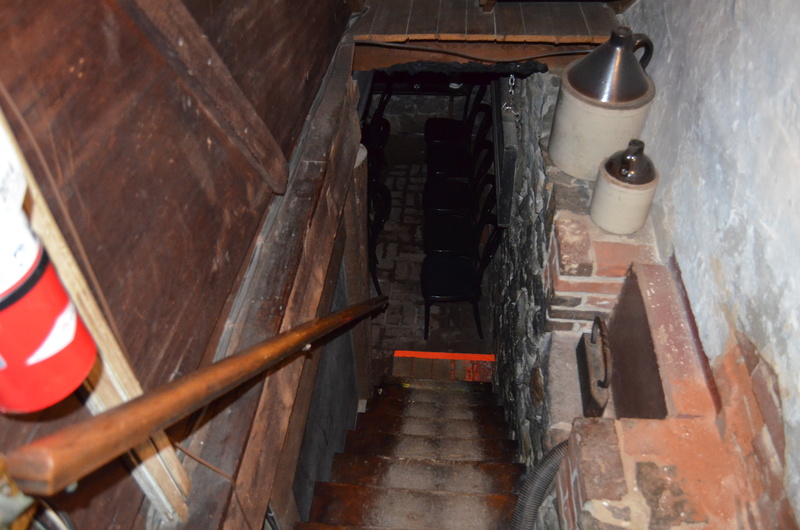 Kennebunkport, Maine – America’s Most Haunted Hotels? Well, no one told Maine that it was summer, because I just left and it was about 60 degrees up there. Refreshing, though! And it smells sweet. You can use your pretty words to trick the tourists into seeing Savannah in the summer, but we all know what it is if we are being honest with ourselves: stinky, sweltering, and buggy. Yeah, I said it. But I digress. Also, even though Tybee Island and Savannah are obviously right on THE WATER, our seafood has never tasted as good as the lobster roll that came out of this shack here. Kennebunkport is a touristy little spot with plenty of shops/restaurants/galleries, and I imagine it gets very crowded, very fast. We killed a few hours there when the beach got too cold. Check out the locks of love bridge. I guess you two crazy kids are supposed to write your names on the lock, and then throw the key into the ocean. What a bunch of assholes. Luckily, if you like to hunt ghosts at night in historic properties, and lounge on blue blood beaches by day, Kennebunkport may be just the spot to spend a long weekend. Don’t tell them I sent you, because some of these places are straight up lips sealed about their ghosties. Pictured below is the Tides by the Sea, which sits on Goose Rocks Beach. The cat is officially out of the bag on this one, since Frances Kermeen wrote about her stay in 2002’s “Ghostly Encounters.” At the time, the building was known/operated as the Tides Inn-by-the-Sea. Emma, the former owner of the 1899 hotel (known back then as The New Belvidere), is said to haunt the building, particularly Room 25. 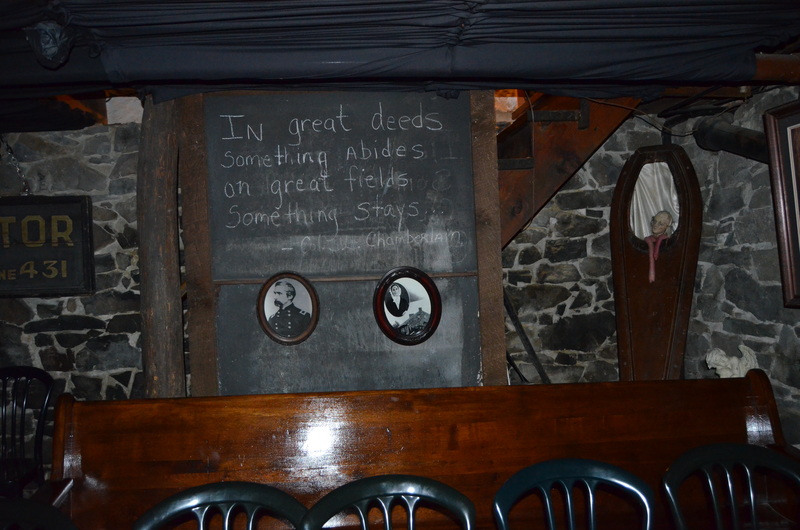 In her time, she hosted such guests as Sir Arthur Conan Doyle and Theodore Roosevelt. According to Kermeen’s interview with the former owners, Emma notoriously had a habit of causing trouble for ill-tempered men who checked into “her” Room (No. 25). 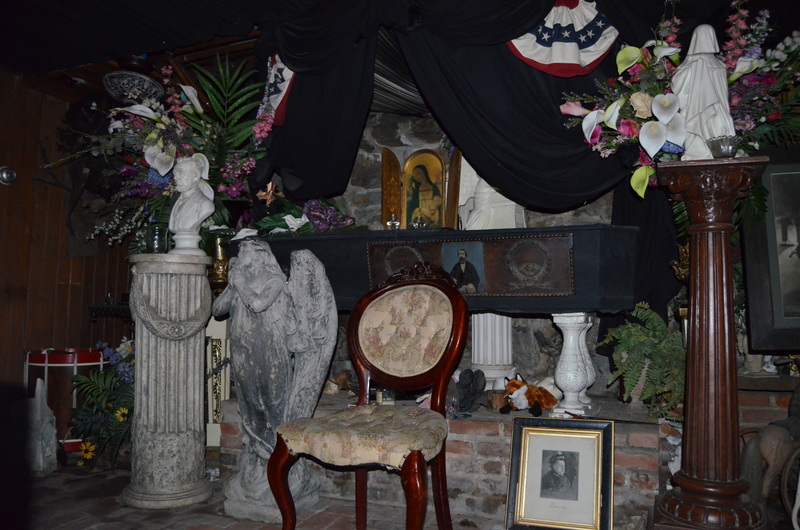 The Captain Lord Mansion has claims associated with it that involve a female apparition walking through the Lincoln bedroom. The Breakwater Inn is situated right off the river (flowing from the ocean) into the port. The hotel is in an interesting position to watch for ghost ships. The Captain Fairfield Inn is one that may have a spirit or two, but as of 2013, the owners were NOT open to exploring or encouraging that line of questioning. Still, reports persist. I have several books in my library that cover this house. The lady doth protest too much, methinks. As always, our travels are kept in an analog version as well. We use “Play,” by Stealth Journals. Play is an indexed book journal that should be used to record all of your good times! Just musing and adding this location to my wish list of future haunted hotels to investigate/visit. Why am I so intrigued? I have an idea that a possible sequel to “America’s Most Haunted Hotels: Checking in with Uninvited Guests,” would feature locations that are either in mining towns; built around natural springs; or are former hospitals. The Lava Hot Springs Inn hits 2 out of 3 wish list categories! After everything I’ve seen, I believe that geology plays a huge part in what we refer to as “hauntings” (for lack of a better term), or at least plays a bigger role than I could understand five years ago when I first started traveling and investigating haunted locations. The hospital theory is based on what I have experienced in connection with traveling and writing my first two books. I felt that the hospitals were more active, even, than the abandoned prisons! One of the theories that you might entertain as to cause is to consider the theory that the people in prisons had probably already given up and resigned themselves to death, while people who died in hospitals went in with the belief that they were going there to be saved. It’s obvious, but I think there is some real truth to the whole trauma/unexpected death theory causing what we refer to as a haunting. This isn’t all there is to it, but it is enough to have captured my attention over the years. High levels of “magic” minerals in the water. Manganese has been associated with shape shifting (could be why people see “shadow figures”). Copper is a conductor for electricity and is used in healing. Iron is used for out of body travel. 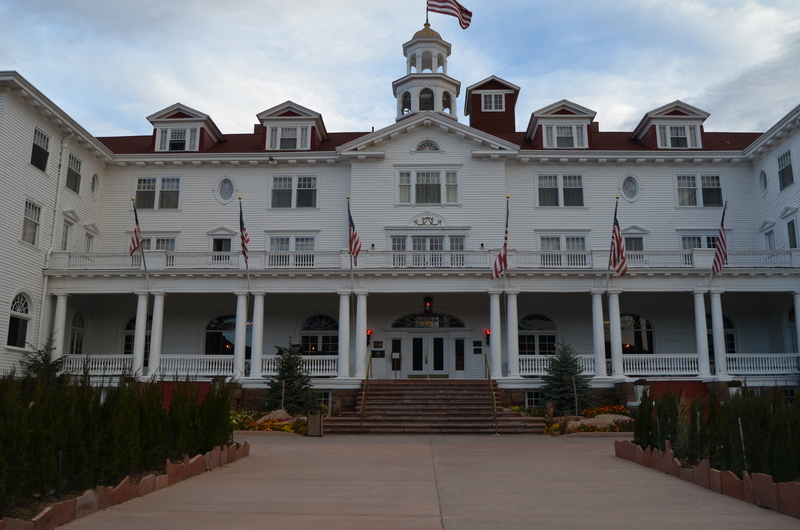 Bob and I spent Halloween weekend enjoying and investigating the famous Stanley Hotel in connection with a chapter for our upcoming book (America’s Most Haunted Hotels: Checking in with Uninvited Guests – slated for a 2016 fall release). The most fascinating question that remains for me is what exactly (if anything) did Stephen King see that fateful night in 1974 that inspired him to write The Shining? If you haven’t heard the back story, allow me to brief you a bit. King had a hit with Carrie, and had just turned in Salem’s Lot. Both stories were set in Maine, and he wanted a change of scenery, so he moved his family to Boulder, CO to work on his next novel. He had been tinkering with the idea of a boy who had psychic abilities, but the venue was tentatively set in an abandoned amusement park, and he just couldn’t work out the logistics of how the family would remain trapped there. He was stuck. Back in 1974, The Stanley closed for the winter, and King (along with his wife, Tabitha), just happened to find their way there on the last opening night prior to the winter shut down. They were the only guests in the hotel that night, and were given what was the best room in the house – Room 217. 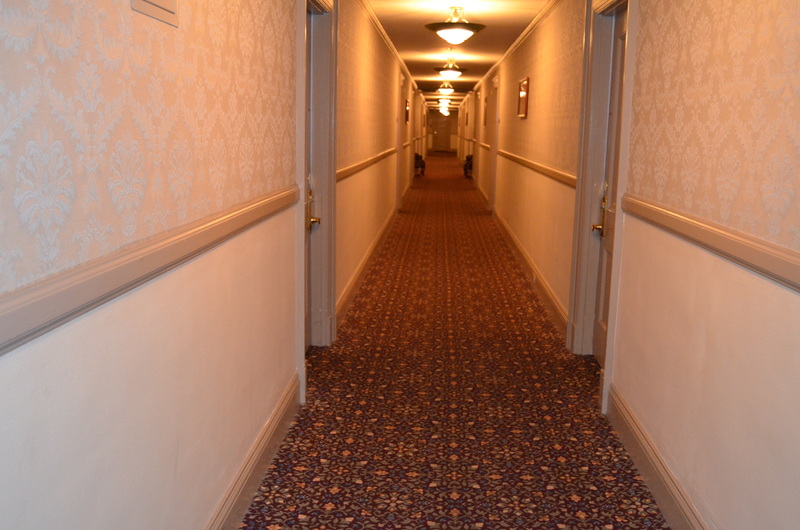 After their dinner, Tabitha returned to their room and King wandered the hallways of the empty hotel. Try as I might, I have not been able to turn up anything on whether or not King had any personal paranormal experiences while staying in the hotel that night. Nevertheless, there is no denying that whatever happened to him during his stay, he was inspired to write The Shining. It is a teaser comment, to me. It can make you infer whatever you want to infer, and maybe that is the point. Perhaps the story is simple, and is one that many of us can relate to. Haven’t we all stumbled upon a place that was “magic” somehow? Maybe the place just made us feel good, or maybe it inspired us to create. After all, that is what travel and new experiences unarguably do. That’s the point – to experience and be inspired. Sometimes the freedom of escaping is the only way to trip the wires. 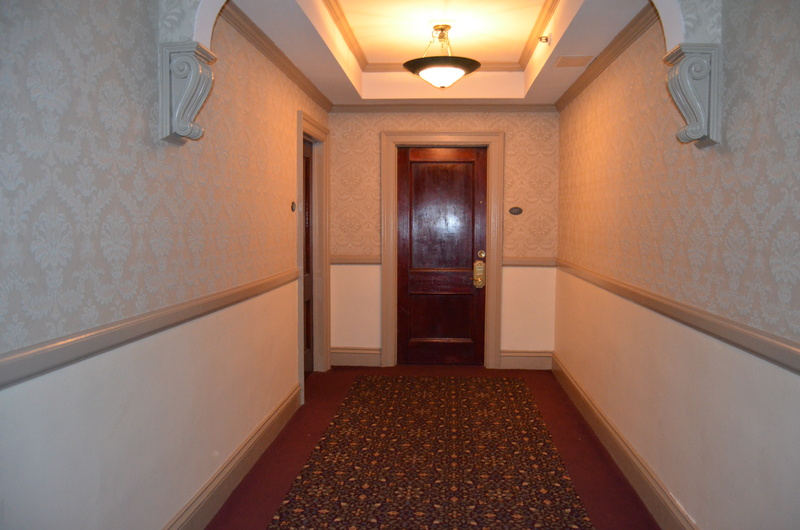 But maybe, just maybe, King was faced with someone or something while roaming the “endless hallways” of the fourth floor of the abandoned Stanley Hotel. I don’t know. 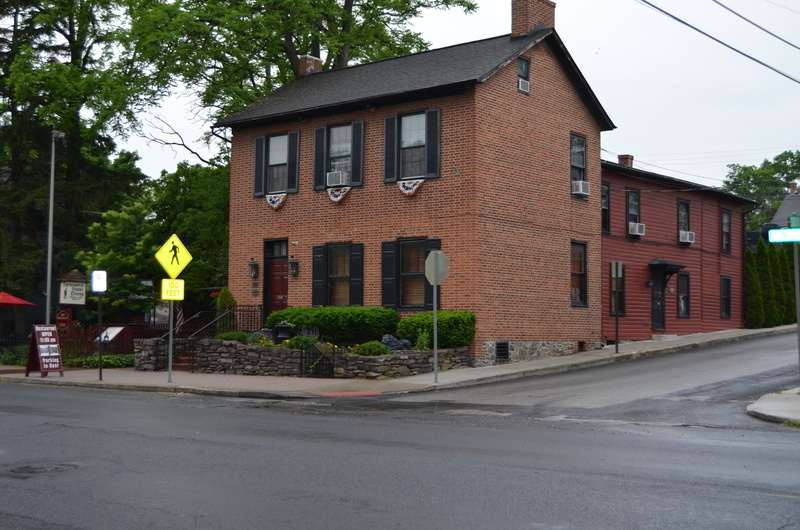 Bob and I stayed at the 1810 Historic Farnsworth House Inn in Gettysburg, PA over Memorial Day weekend in connection with our upcoming book with Llewellyn (“America’s Most Haunted Hotels: Checking in With Uninvited Guests”). The history and hauntings will be addressed in the book, but for now, follow me into the house and downstairs into the depths of the basement. The Mourning Theatre is held down here (stories told by candlelight). 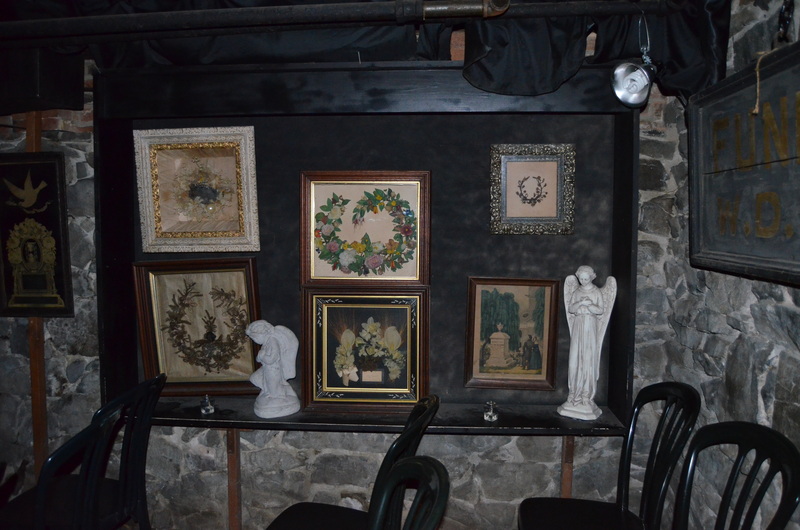 There are many original artifacts from the Victorian Mourning Period in the basement, including these hair wreaths, pictured below. Traditionally, when a relative died, a surviving family member cut off a piece of the deceased’s hair and sewed it into the family wreath and hung it on the wall like that was a totally normal piece of art. This was a way for the family to remember their loved one, and especially so if they could not afford the expense of photography. The Victorians were also fond of using the hair in jewelry. I have no idea what sort of weird residual attachments might go along with having that amount of strange, dead, human hair stored in one place that has so many deaths and tragedy connected to the sight. It is worth considering though, when you think about the reasons for the hauntings. After all that darkness, we headed for the light of the battlefield. It was a haunting place, but peaceful just the same. 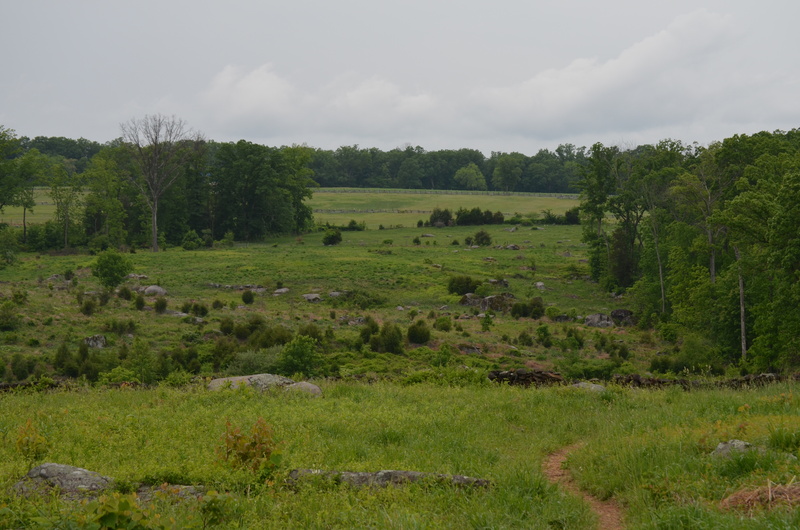 Gettysburg battlefield, near the Devil’s Den area. 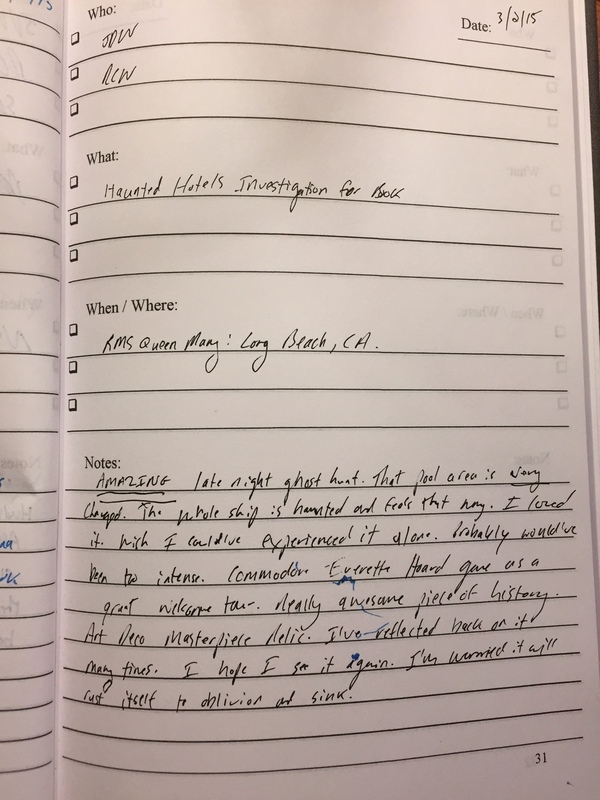 As always, we log our adventures inside our “Play” Journal, by Stealth Journals. “Play,” is an indexed book journal by Stealth Journals that should be used to record all of your good times. Why is the RMS Queen Mary Considered to be One of the Most Haunted Hotels in the World? The Queen Mary has been called one of the most haunted places in the world, and perhaps there is a great deal of truth to that label. Bob and I investigated the ship in March of 2015 for our upcoming book with Llewellyn “America’s Most Haunted Hotels: Checking in With Uninvited Guests.” Brian Clune and Bob Davis wrote about the ghostly legends surrounding the ship in their 2014 book entitled Ghosts of the Queen Mary. The late Peter James (former resident ship psychic and probably most famous for the television show “Sightings”) thought that he had been in contact with about 600 spirits during the course of his employment on board the ship. What are some of the most popular stories that are discussed in the Clune/Davis book that could explain some of the hauntings? Allegedly, when the ship was being built in 1934, two men died and their corpses were later discovered close together, with a welding torch nearby. Peter James thought that the spirit called “John Henry” was one of these men. A spirit of a ghost girl, thought to have broken her neck from a slide down the forward third-class banister. During the war years, many people died onboard of heat stroke and exhaustion. People have heard sounds of screaming and rushing water in the area of ship where the propellers used to be. Perhaps this is a residual effect from the Curacao accident of 1942, which killed 338 men. There is a little girl spirit called “Jackie” that could be from the late 1940’s. An officer ingested poison and died on the ship. 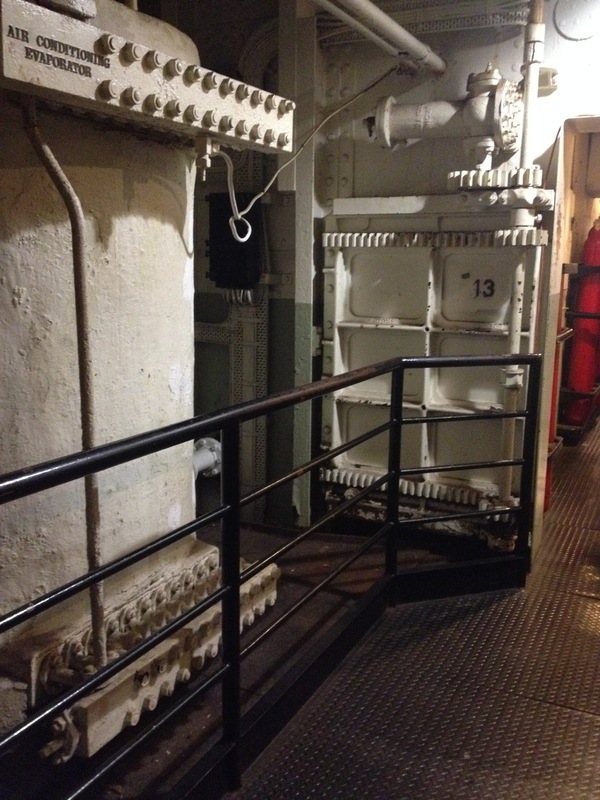 John Pedder was crushed in a watertight door (Number 13) in 1966 when he was working in the engine room. I have another possible theory for all of these hauntings that I have not seen discussed in print or even heard anyone mention in passing thus far. Sometimes, passengers and crew members were buried at sea. I find this tradition to be particularly haunting for some reason. It just seems so lonely and unsettled. You can never really know what happens to the body, and no one can ever visit a grave. But, there is a purity in it too. After all, if you are a transient (and aren’t we all if we are brutally honest about it), you are just passing through, wherever you are, and no matter if you have been in the same place for the last twenty years, you are still just a transient here on Earth. Exhibits in the ship state that traditionally, a sailor would be sewn in his own hammock, but first, a stitch would be made through his nose first to make sure he was actually dead. In modern times, the burials at sea would be completed by wrapping the body in about three yards of canvas, and the last stitch was omitted from the customary historic ritual. I consulted a research paper (“Interment without Earth: A Study of Sea Burials during the Age of Sail) by a student at Duke University by the name of Johnathan Pryor to learn more about the customs of sailors in handling the dead while at sea. Historically, there exists much superstition among sailors from every culture about having a corpse on the ship. There were important rituals that must be done in order to avoid invoking the anger of the dead. The body had to be washed, dressed and enshrouded, a service had to be held, and then the body would be committed to the deep. Often, the body would be weighted by a cannon ball, shackles, or chains to make sure it would not surface. Taking into consideration that there do not seem to be any records of burials at sea while the Queen Mary was serving as a war ship during World War II (from about 1939 – 1946), it really makes you wonder just how many men were thrown over, and if there is something to all that superstition after all. 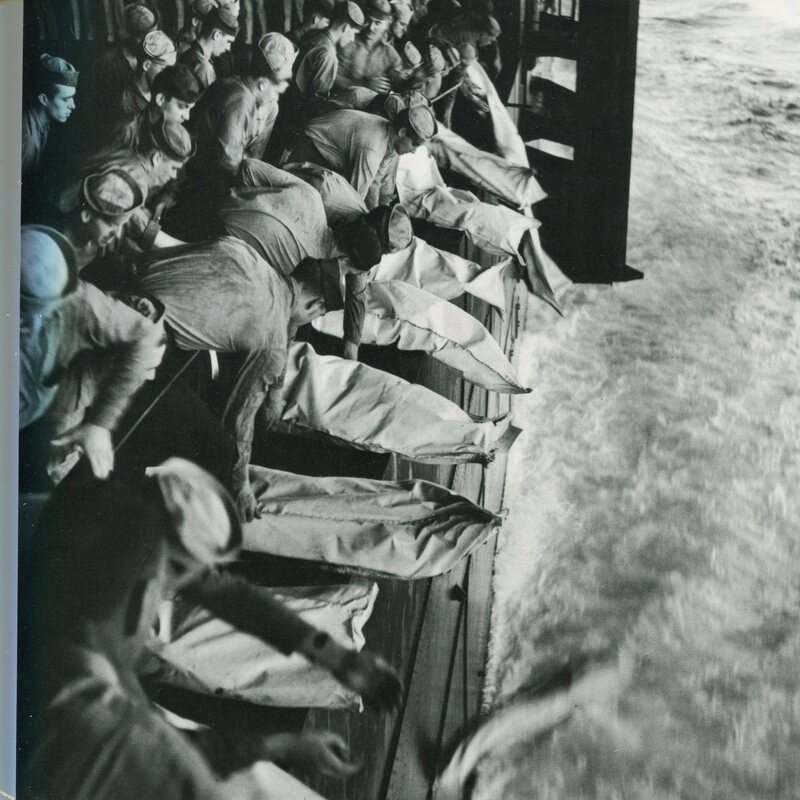 There is a very famous (and haunting) image on file with the National Archives that is of a burial at sea on board the USS Intrepid after an attack during World War II. Matthew Schulz is the RMS Queen Mary Paranormal Investigation Tour Host. The evening began at 11:00 p.m. and lasted until well over 3:00 a.m. Our first stop was in the engine room and we were briefed on the legend of John Pedder (a worker who was crushed by a watertight door on July 10, 1966 on Voyage 483 West) and introduced to dowsing rods and some other tools. We were allowed to wonder for a good deal of time in the area alone, or with a small group, and I ventured off by myself to explore and take photos. The lights were kept on (I would imagine it is for insurance reasons), so it was a little difficult to “get in the mood,” so to speak. Nevertheless, the photo opportunities were incredible, and it was a good experience to be down there without a large crowd or to feel rushed through at all. Our next stop took us to the boiler room and to the green room, where there was an impressive set-up of experiments. There were laser grids set-up for us to sit quietly and watch for shadows to break the light displays. There were also headsets in the green room that were connected to a recorder with a ten second delay to listen to any EVPS captured in real-time! While I did not personally experience anything while partaking in this part of the hunt, I did note how progressive and thoughtful this outfit was. I have yet to be anywhere where this type of technology is being used during public events. Typically, they just walk us through with a flashlight and that’s it. Matthew had quite the set-up going on! The last area on our hunt was the first class swimming pool and dressing room. We walked (or scaled) across a dark catwalk to get there. I am struggling with how to write about my feeling and impression of this area without sounding like a melodramatic sap. The best way that I can think of to convey how it felt was that it looked as though I had stumbled upon one of those old Hollywood synchronized swimming movies. The area is extremely dimly lit, and it is hard to make out the colors in the old tile, although they appeared to be a mint green and yellow. 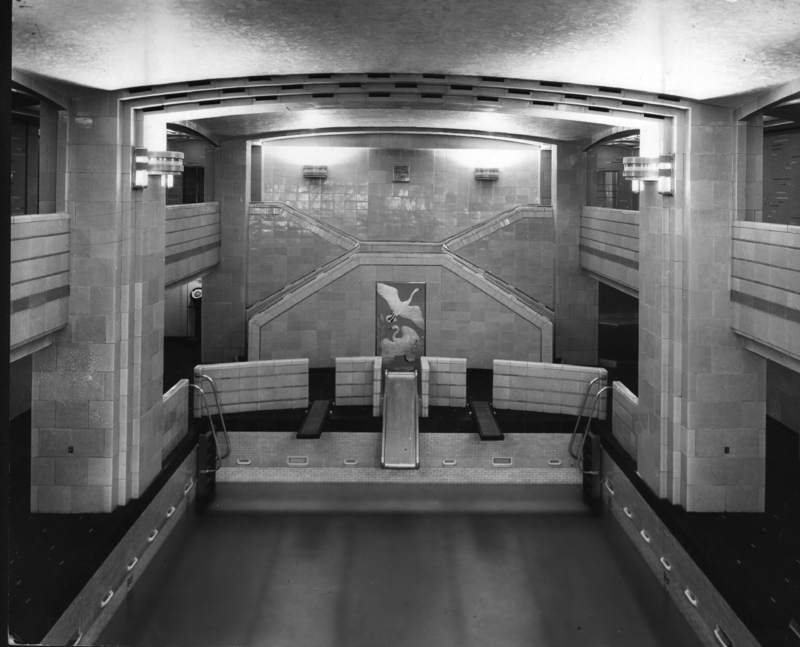 While the pool has been drained for structural reasons, and is in a state of disrepair, it is evident that the room used to be quite the beauty. It feels otherworldly, to say the least, and almost electrically charged. 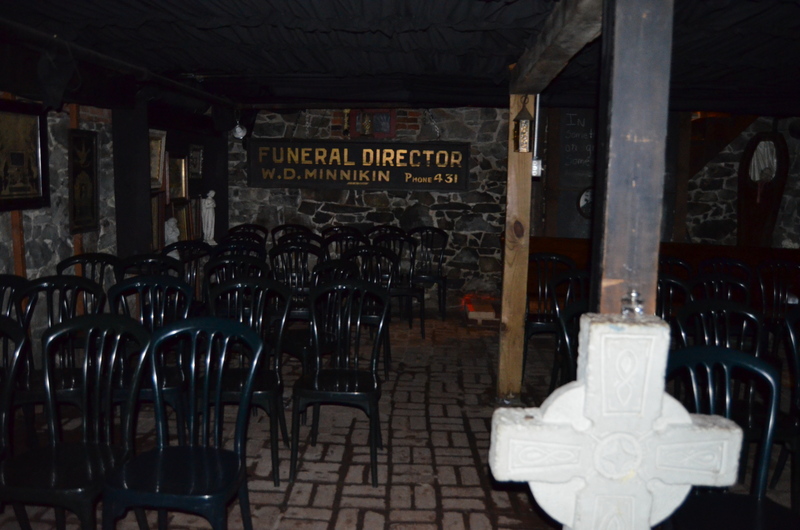 The strangest thing that happened here was that our entire small group was gathered closely together by the stairs and were listening intently while our guide spoke to “Jackie,” the famous spirit believed to be a little girl. 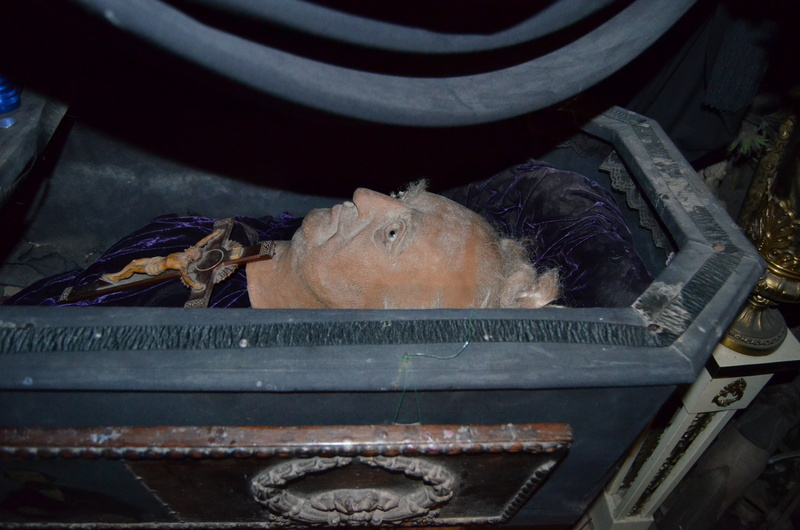 Suddenly, we heard what sounded like the disembodied giggle of a little girl over our heads! The Ghosts & Legends tour that uses special effects was actually closed down for maintenance on my March 20, 2015 visit. It seems unlikely that given the approximate 2:45 a.m. time, that there would have been an actual child outside the room somewhere making the noise. Additionally, everyone in the group was legitimately shocked to hear this sound. There was no one above us, and I don’t believe anyone in the group made this sound. I saw everyone’s face and no one looked like they were guilty or having a laugh at everyone else’s expense. Is it possible that we were experiencing one of those DVP’s (Direct Voice Phenomenon) that Peter James used to report and that Brian Clune and Bob Davis have written about? Things got weirder when we moved the party to the dressing room. It could have been a combination of the pitch darkness, the late hour, how tired I was, and the fear effect, but as we all divided ourselves up and claimed individual changing stalls for our own, I started to get a little bit uneasy. The uneasiness grew to a feeling of outright uncomfortableness, and then spiked to absolute terror. I was alone in the pitch dark, but ultimately in close range to a group of people, including our group leader, who had been very nice and accommodating to me coming alone on his tour without a small group of my own. I have no idea why I started to panic. After all, we were in the dark earlier in the green room and in the boiler room. I really had to talk myself down in my head. I started getting control of my breathing, and I had to keep repeating to myself that I was okay. There was a moment where I felt frozen, and I was afraid to turn around in my stall, because I had an image in my mind of a bad lady who had stringy long hair, black eye sockets, and rotting flesh. I rationalized that as long as I refused to acknowledge her existence, she couldn’t get me. This is a case of your mind running away from you, because there are no documents of anyone drowning in this pool, and Matthew had not been telling us scary stories in the dark. In fact, he had not even said anything about a woman haunting this area at all, our focus was completely on trying to make contact with Jackie, the child spirit. I was just standing alone in the dark, replaying every horror movie I had ever seen on a loop in my own head, like a crazy person. I felt my knees buckle, and I had to steady myself by bracing both arms against the walls. When I came across these passages, I found myself covered in goosebumps from head to toe. Reflecting back upon my ghost adventure while on board the RMS Queen Mary, I am only left to wonder if there is something to those vortex claims about the first class swimming pool after all. 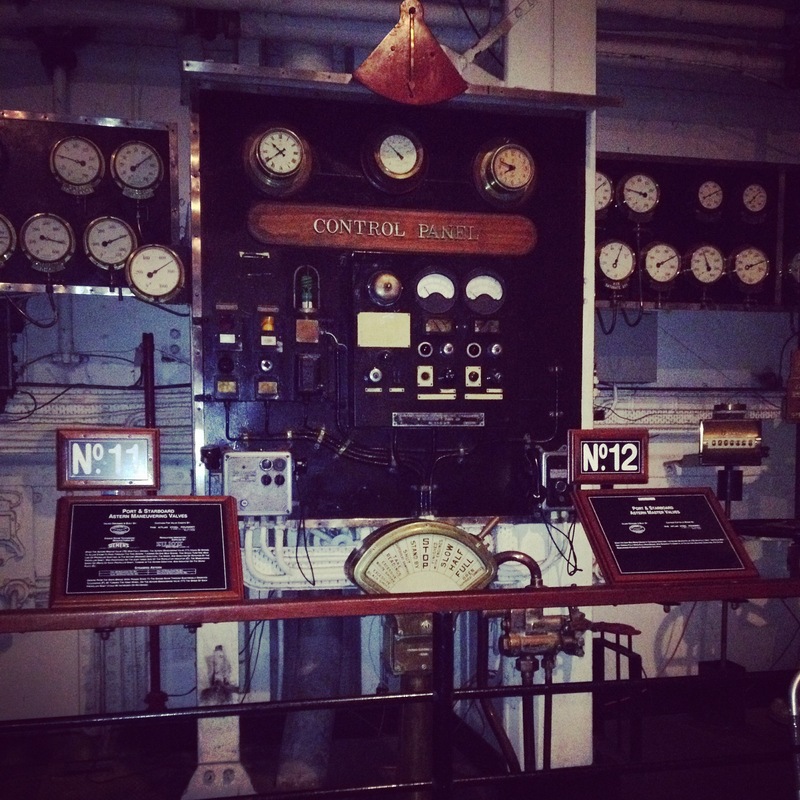 RMS Queen Mary: Play, by Stealth Journals.